It feels wrong to be posting this with the ignorance I have of anime, but no doubt our resident expert will correct me on glaring errors I inevitably make. 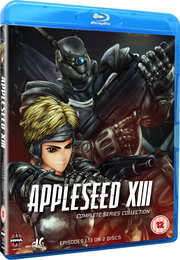 Out this week on both DVD and Blu-ray, courtesy of Manga Entertainment, is the anime title Appleseed XIII: Complete Series. A CGI adaptation of Masamune Shirow's Manga series, this features the voices of Kouichi Yamadera, Hiro Shimono and Maaya Sakamoto. With a street price of around £19.99 for the DVD release, and £24.99 for the Blu-ray, each contains all 13 episodes spread across 3 and 2 discs respectively. Following a global conflict that resulted in the extermination of half the world’s population, a utopian city nation has risen from the ashes and ruins of the war. Olympus is a shining beacon of human civilization, governed by a near-omnipotent computer known as Gaia and maintained and managed by a majority population of artificially created half-human, half-robot Biodroids whose duty is to ensure the wellbeing of the minority human populace. But there is unrest within this seemingly perfect paradise. Racial, religious and political differences continue to cause unrest amongst the people and a terrorist group known as the Human Liberation Front threatens to destroy Gaia and the Bioroids in the name of human “freedom”. You can read a review of the DVD release here.